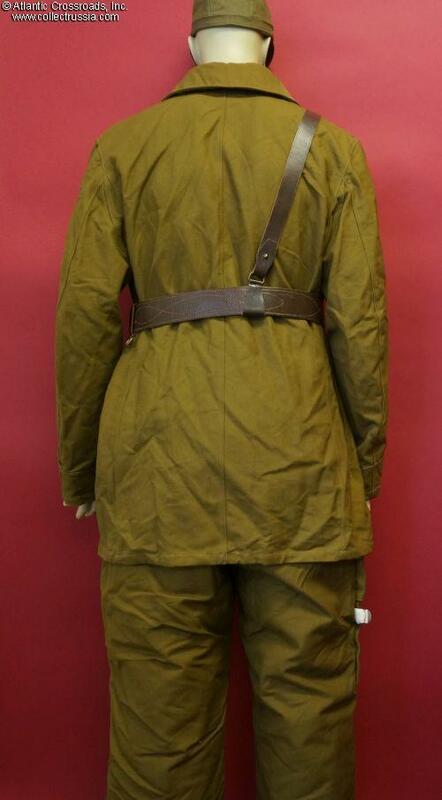 Winter Uniform of the GRU (Soviet Military Intelligence) Spetsnaz, size 52-5, dated 1977 / 76. 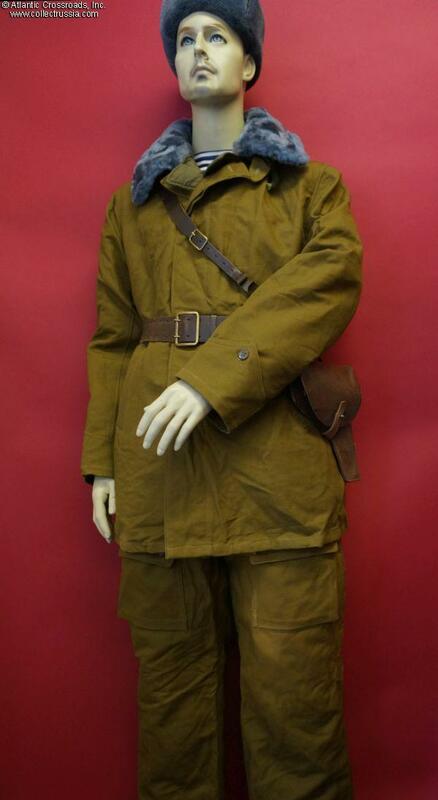 Winter Uniform of the GRU (Soviet Military Intelligence) Spetsnaz, size 52-5, dated 1977 / 76. 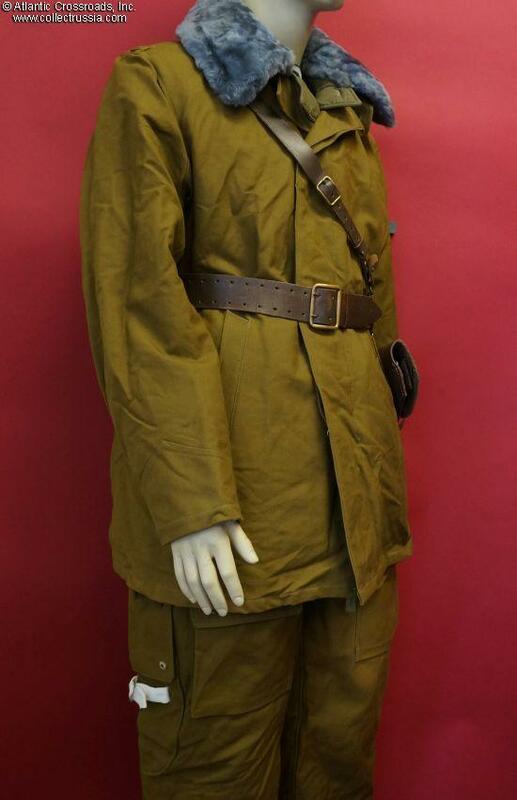 Includes heavy tunic with plus padded button-in cold weather liner, dated 1977 and matching pair of pants by the same maker, also with detachable liner, dated 1976. 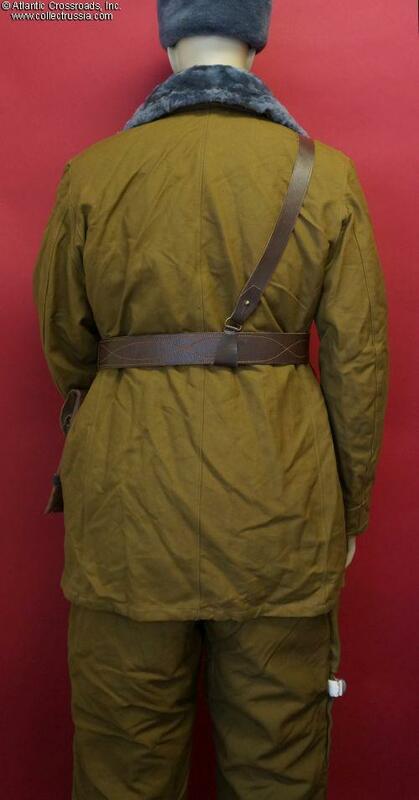 The tunic is a very early model having internal hip pockets, no breast pockets. Unlike the later models, there is a provision for detachable shoulder straps. 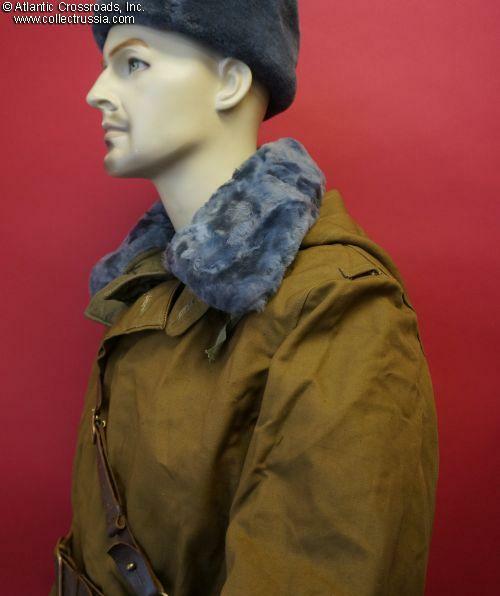 The collar is real lamb's fur (called tsigeyka in Russian) died regulation bluish gray, of much finer quality than the cheaper, coarse wool pile collars used on similar uniforms later on. 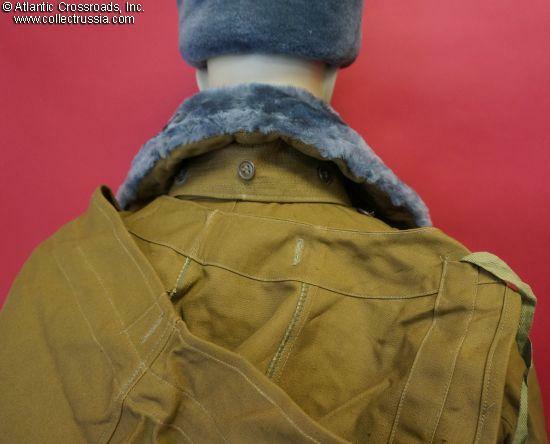 There is a detachable hood in the same olive drab material secured with buttons under the collar. Small sewn-in pistol pocket is lined in tough black synthetic material. 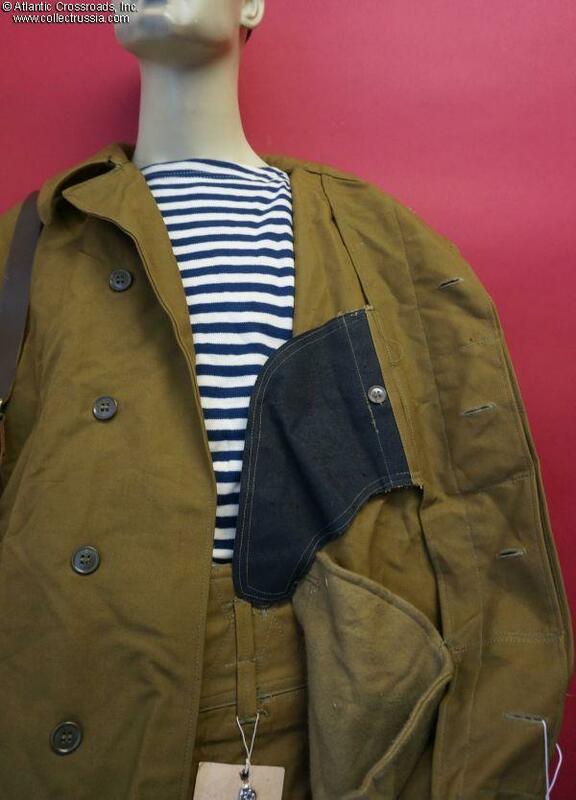 The sleeves have cuff pockets and internal woolen cuffs for extra protection for the wrists. 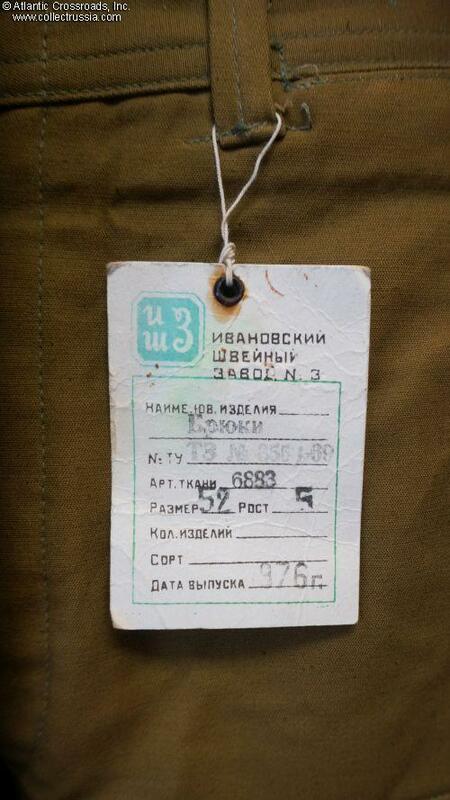 The jacket has an attached paper tag of the Ivanovo Garment Factory (Russian Federation) showing a 52-5 size and November 1977 date of manufacture. 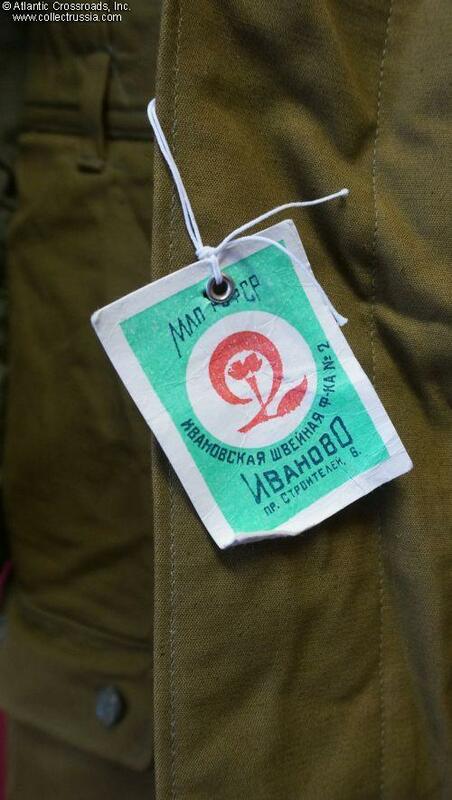 Interestingly, the tunic itself doesn't appear to have any marks or stamps that would identify the factory or even give a hint that this garment is in fact Soviet-made. 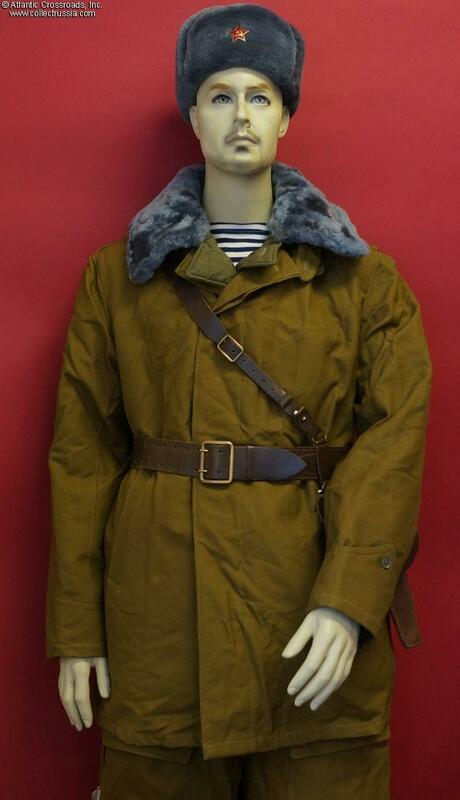 This very uncharacteristic of military or civilian Soviet clothes of the period and probably has to do with the intended purpose - i.e. covert operations - of this particular uniform. 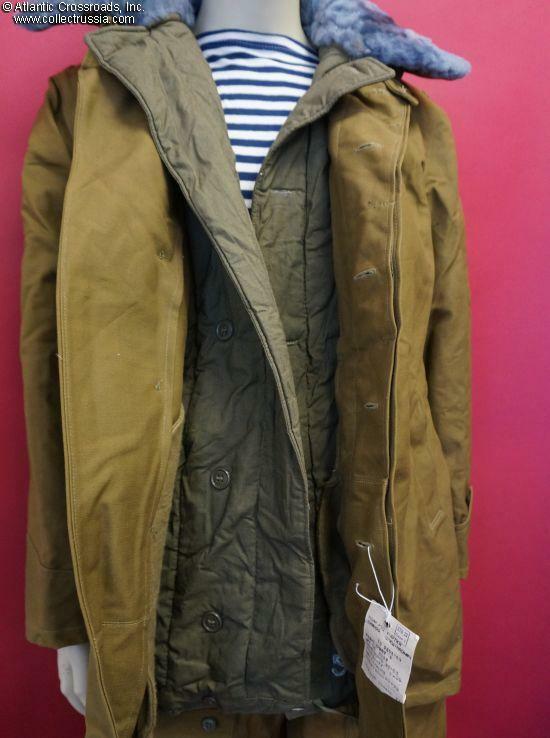 The jacket will fit someone with a 46" chest and a 32" total length. 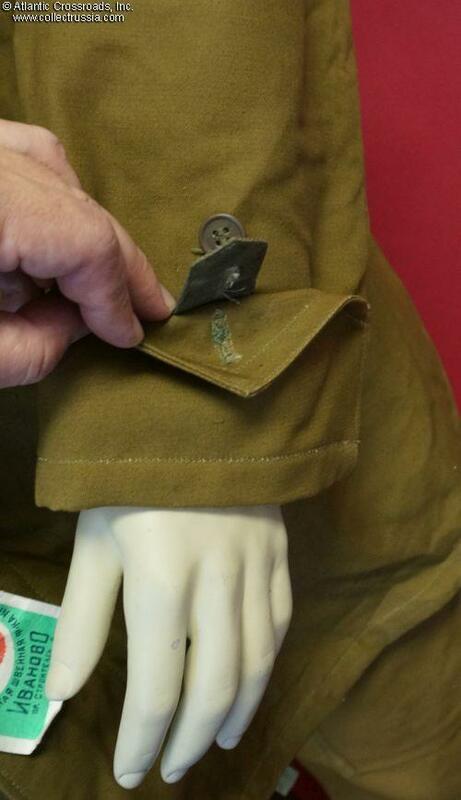 The sleeve length is 25" from sleeve seam to bottom of the cuff. 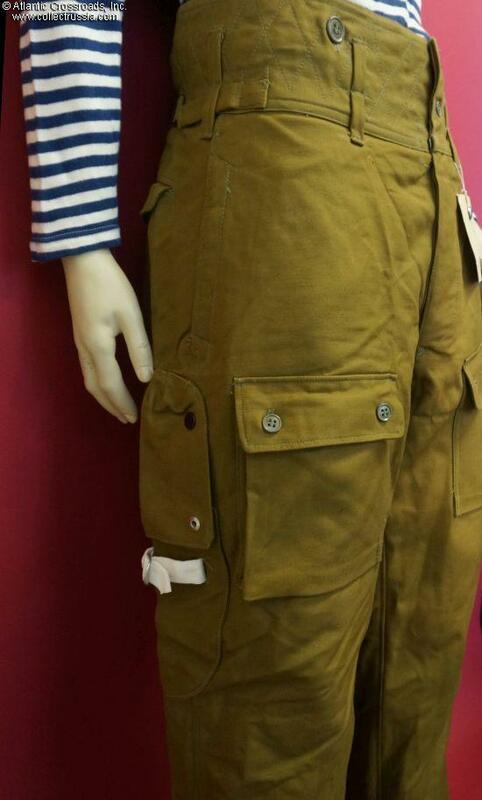 The trousers have two regular pockets as well as two cargo pockets on the upper leg fronts; note that the cargo pockets have exposed buttons unlike the later models. 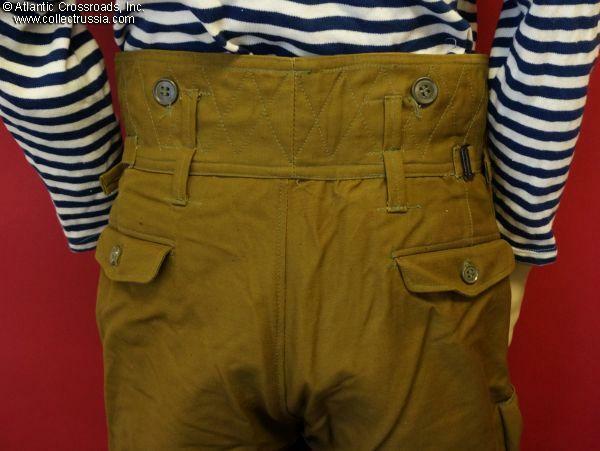 Also characteristic of the early model, the waist has small tabs with metal buckles for size adjustment. There is also an external knife pouch on the right leg with a separate canvas belt. 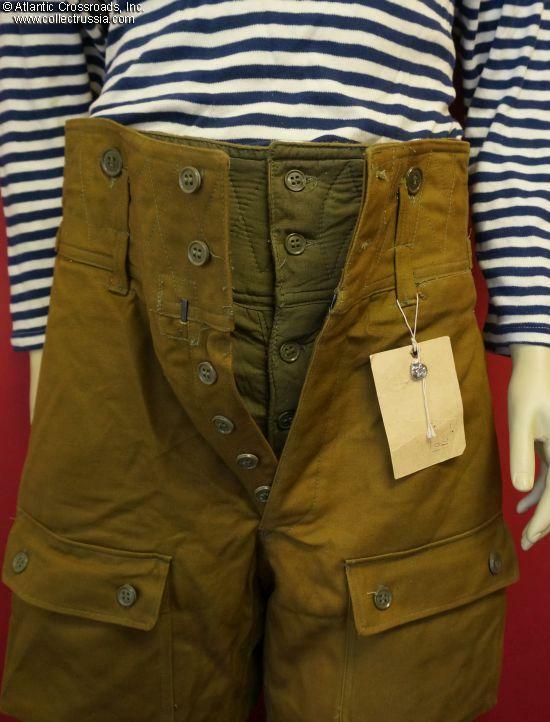 Adjustable size tabs at the pant cuffs. Tie down stirrups at the bottom of the liner legs. 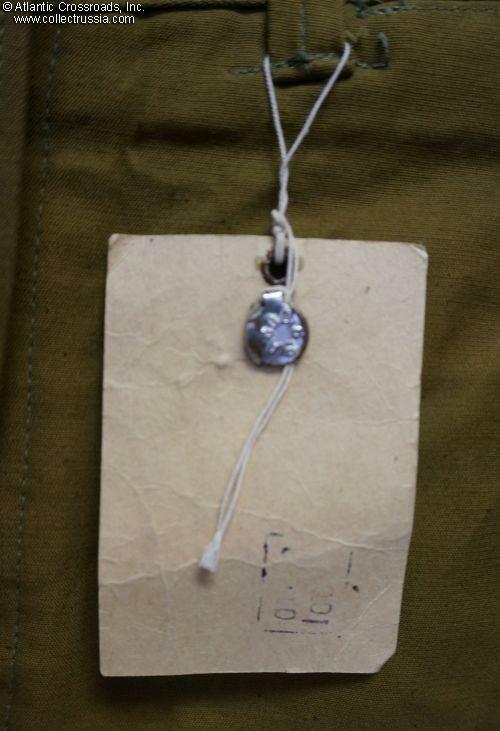 Attached with a drawstring and secured by a tin seal is a paper tag of the same manufacture in the city of Ivanovo, showing the matching 52-5 size and a 1976 date. 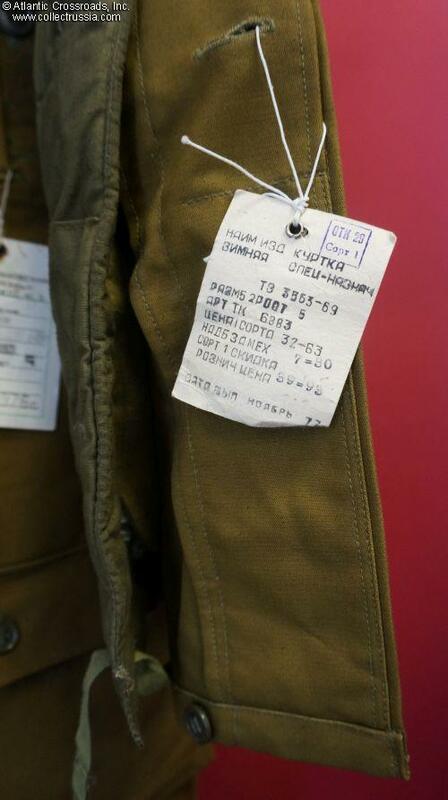 Just like the jacket, there are no manufacturer or control markings stamped directly on the pants. 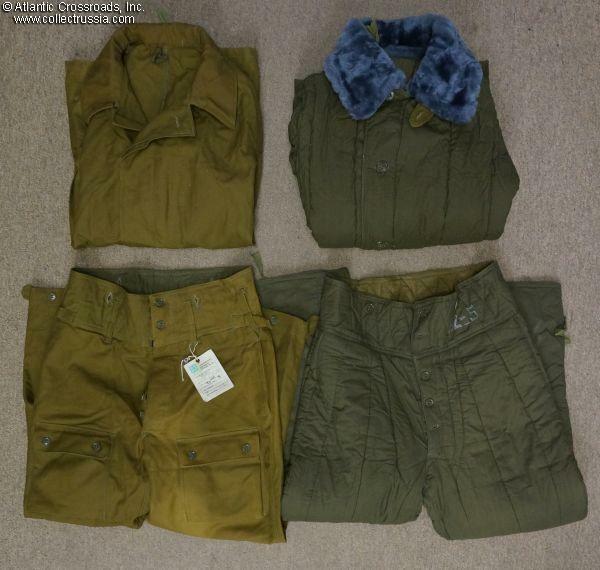 The pants are 36" waist, inseam 29" and 44.5"total length. In excellent unissued condition, shows only storage age. 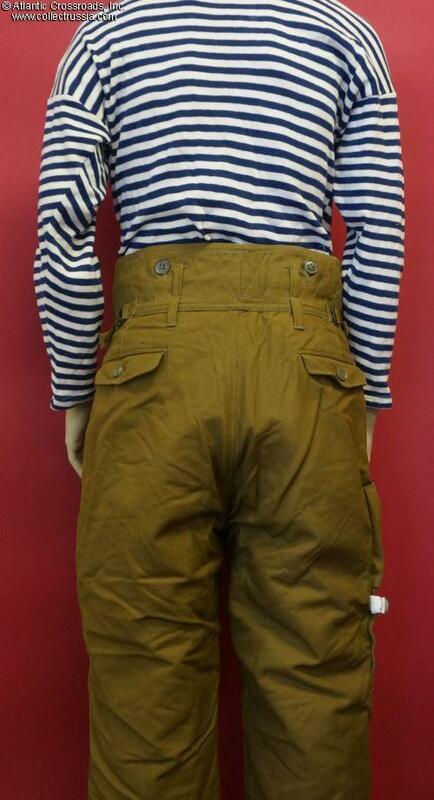 Please note, the striped shirt, hat, belt and other items in our photographs are not included with the uniform. With the exception of the weapon, the accoutrements may be available elsewhere on our site. 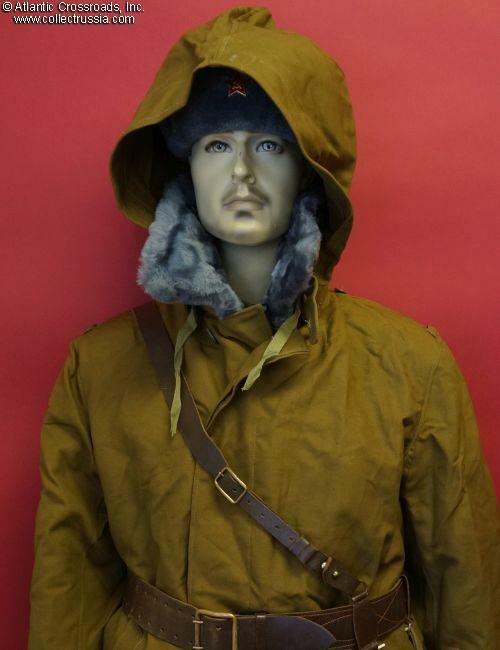 /See "Camouflage Uniforms of the Soviet Union and Russia, 1937-Present" by Dennis Desmond, C.1998, Page 90/.